RIVERS OF NIHIL with Darkest Hour out at the Starlight Lounge. Rivers of Nihil tearing up the Starlight Lounge in Sacramento, CA. El Muerte interviews Rivers of Nihil at the Starlight Lounge in Sacramento. From the Starlight Lounge in Sacramento, CA on 3/9/17. 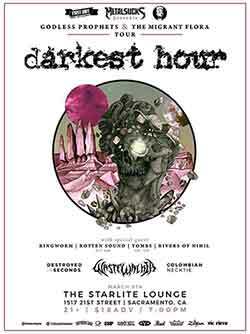 RIVERS OF NIHIL touring with Darkest Hour out at the Starlight Lounge in Sacramento, CA. In an interview with El Muerte of Rock Hard Live, Brody talks about complications during the tour, with bands dropping off and adding others. He also talks about their latest release, Monarchy, released via Metal Blade Records, stating that the album has "doubled who they are as a band."